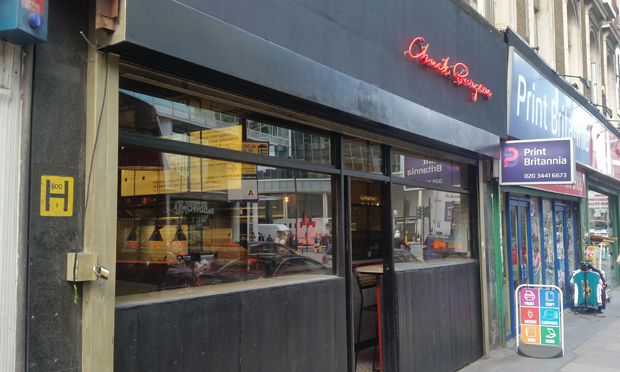 Tucked in at the end of Commercial Street – just before it opens out onto Aldgate East station and the surrounding chaos – you’ll find Chuck Burger, plainly fronted with a black sign and solitary neon light. The place is outfitted with no-nonsense tables, industrial metal fittings and paper menus, a bugbear for some but one that’s never really concerned me at laid-back fast-food restaurants. If you’ve ever visited a Meat Liquor restaurant, think that kind of mess-hall layout, but more laid back and without quite so much nightclub lighting. Add a smidgen of Yankification as well, which stretches to its drink selection – resplendent with American and American-inspired beer offerings including the white-collar hipster’s choice Pabst Blue Ribbon, along with cocktails and ‘hard’ milkshakes with added rum. Aiming to get into the American spirit, I decided to start with the diner staple that is the Oreo milkshake. However my sense of place was swiftly rerouted back to East London once I noted that said shake came in a jam-jar, as most things do when you’re that close to Shoreditch. Nonetheless it totally hit the straw-clogging spot, and I was ready for real food. However the effectiveness of the cooking techniques, and therefore the moistness of the meat hidden away under the sauce and skin, ensures that the flavour of the chicken is not lost – a minor miracle. It’s a similar story with the burger. The meat, at the centre of it all, speaks for itself – it tastes clean, fresh and with a perfect medium-rare texture. As Chuck prepare their own patties, they can even legally take it down all the way to rare – a treat for punters still gnashing their teeth about the pernicious effects of ‘elf and safety on the redness of their beef. The additions, which consist of red onion, pickle, American cheese and Chuck relish (which includes Sriracha, seemingly a house favourite) in the cheeseburger, are nice but nothing out of the ordinary – think Burger King if they upped their patty game. I find myself wishing I’d plumped for a more adventurous item: perhaps the halloumi stack, or the Thai inspired pork ‘Same Same’ burger. The burgers range from £6.50 to £8. If I were to pinpoint a disappointment, it would be that the onion rings, listed on the menu as “pickled onion rings”, had no discernable difference in taste from the usual, and in fact were a little too thin and overwhelmed with batter. The fries, McDonalds-esque in their slimline saltiness, or the sweet potato fries, are potentially better options side-wise. 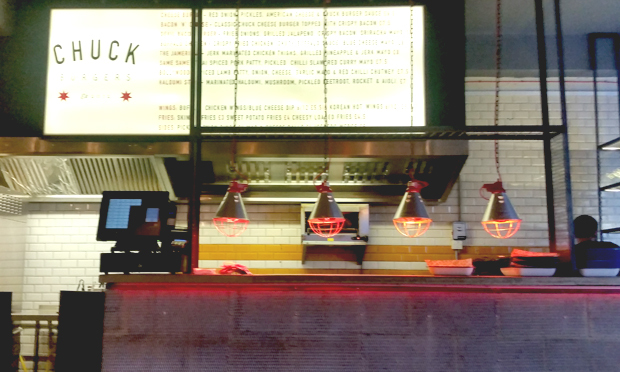 However, for those hoping to knock back a few beers and some meat in a comfortable setting, Chuck Burger can barely be quibbled with – they certainly get the ‘meat’ bit 100% right.